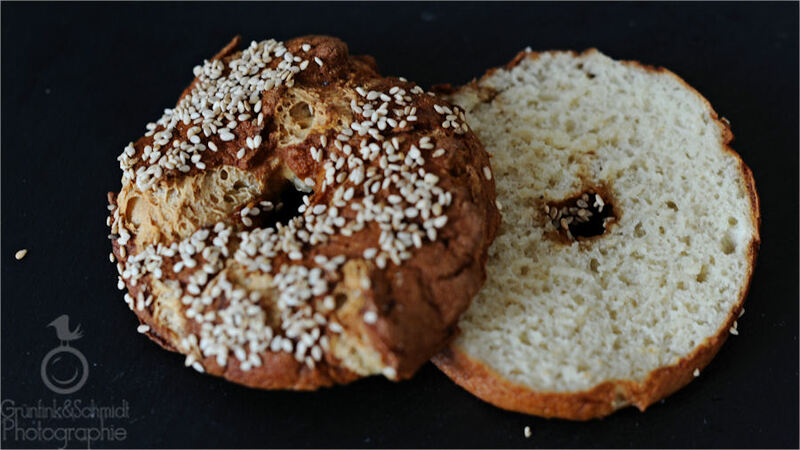 The best gluten-free bagels EVER! Last night, I dreamt that someone told me a secret. It was revealed under pressure, in an uncomfortable situation. The world split open, and exposed a completely new and different universe in which nothing was as it had been before. It completely changed my way of looking at them. When I woke up, I was glad the secret was not one waiting for me in reality, but it got me thinking about secrets and how they are usually truths about ourselves or others, which we try to hide from the world, simply because we are afraid of how we would look if they became public knowledge. And how you can keep secrets without others suspecting that you do, how one secret can give you a very deep understanding of another person and how it can be unbearable to be unable to share something with others – or at least just one person, because if you told them, then the world could, maybe, split open and reveal a whole different universe. Oh, the possibilities! Oh, and of course all of this reminded me of my friend Susie’s cover of Mary Lambert’s Secret. So here is a secret about me: I used to be in school plays. In one, Susie was Annie. I was Ms. Hannigan. It was great fun. I have no pictures, just in case you are wondering. Anyway, since I don’t actually know the original of this song (and once I went to check it out, I liked Susie’s version better, which is on the uke, as are all good songs), here goes Susie’s version. Then, after getting all of my Saturday chores out of the way (the fridge was empty! 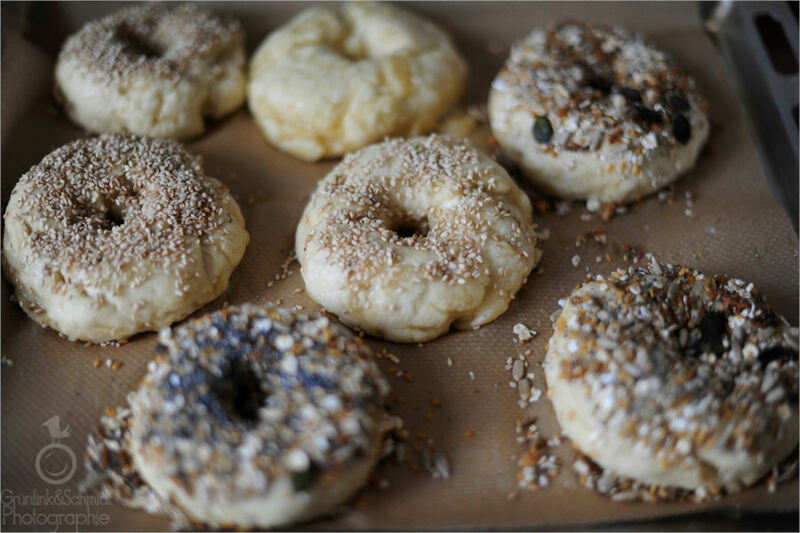 ), I decided to explore the secret behind gluten-free bagels, one of my favorite ways to eat bread. I was immensely successful and want to say that this is one of the best things to have ever come out of my oven. Simply spectacular! I may want to go back to the lab, in order to change the rather dark color of the plain ones, but I’m not modifying a thing about the dough, which is fluffy, rich and perfect in taste. 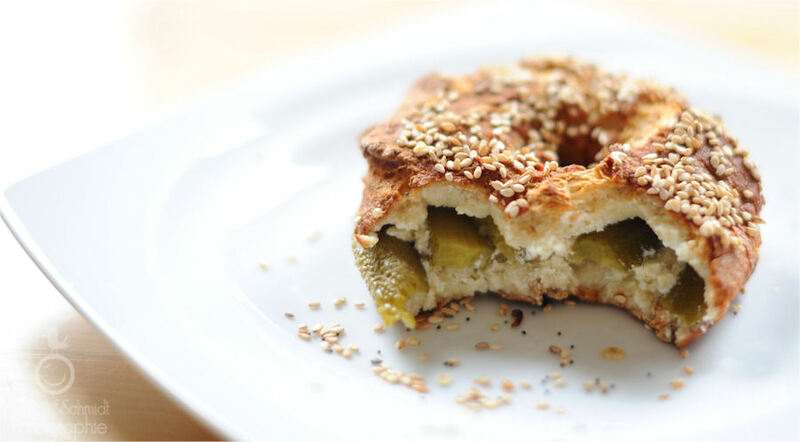 A bakery could not have made a better quality bagel. I promise! Lucky for you, I wear my heart on my sleeve and share all my secrets. At least the ones pertaining to the happenings in my kitchen, hehehe. Enjoy! 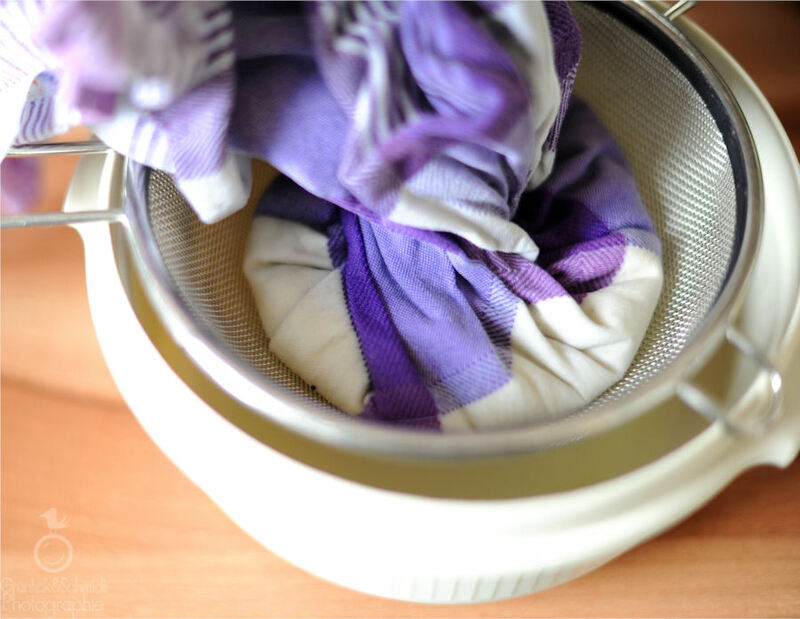 Place a kitchen towel (or a cheese cloth, which would be even better) into a strainer and the strainer into a bowl and pour the yoghurt into the towel. 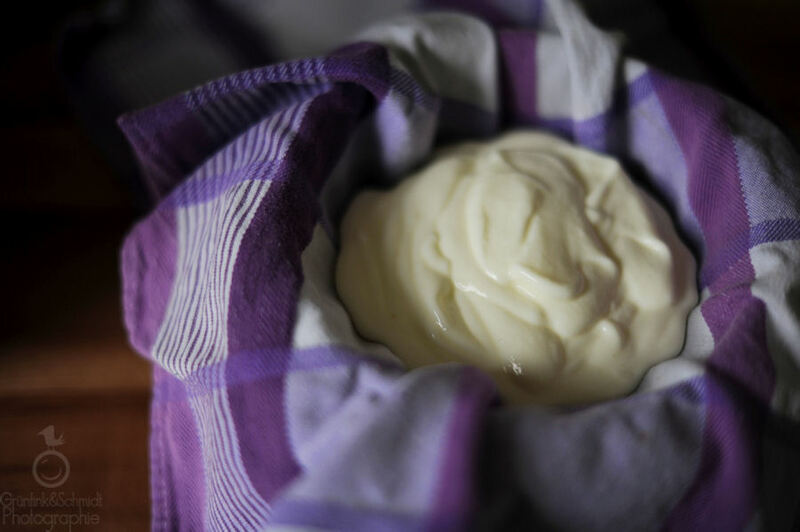 Tie up the kitchen towel into a knot and let the yoghurt drain for about an hour. 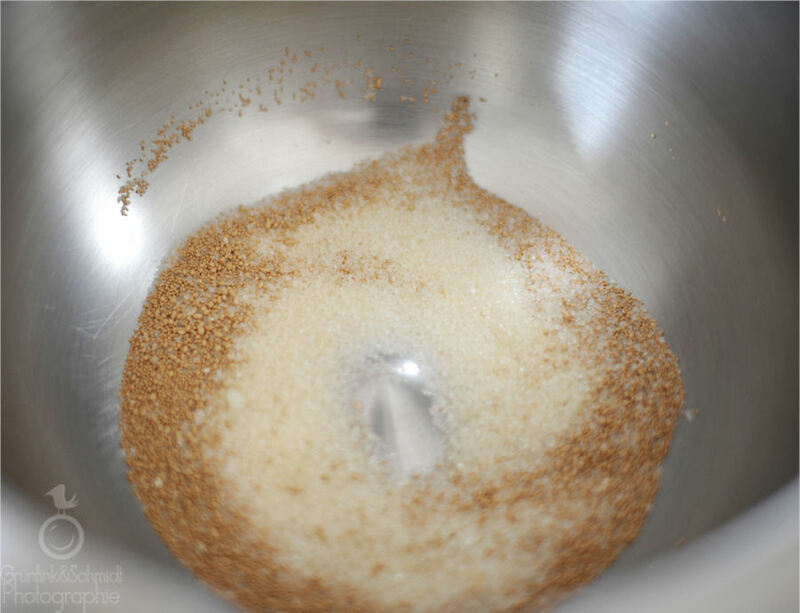 Once the hour is up, place the 30g sugar into a bowl together with the dry-active yeast and add the soda water. Whisk until the sugar and the yeast are completely dissolved. 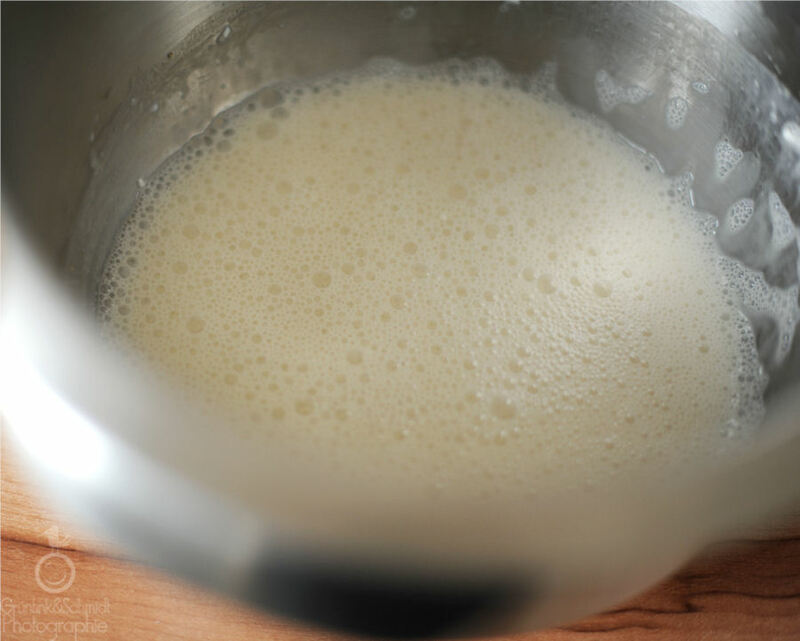 Remove the remainder of the yoghurt (there may still be a bit of quite liquid yoghurt in the middle, which is ok) and place into the yeast-water-sugar-liquid. Stir well. 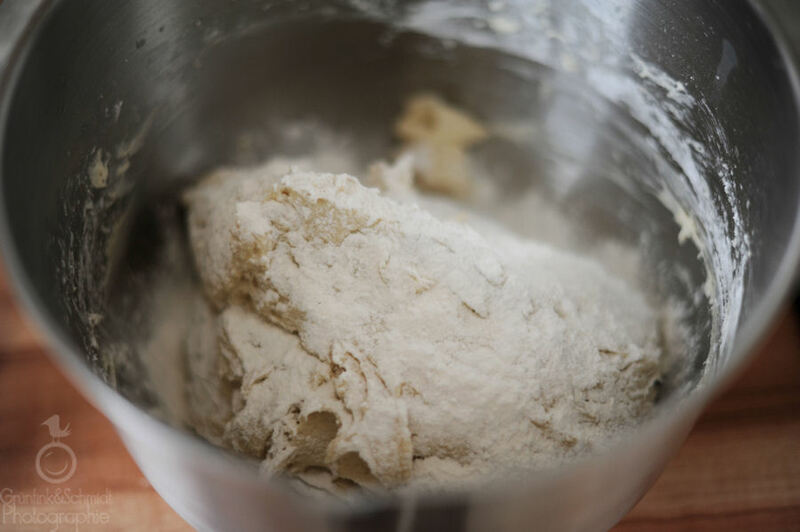 Mix all of the dry ingredients together (all the flours, the gluten-free agents, the baking powder and baking soda) and add about 200g of the flour-mix and the white vinegar, knead for about five minutes and let rise until this starter has doubled in size. Then, add the remainder of the flour (except 50g) and knead for about ten minutes. If you want to add something to your dough (e.g. grated carrots, dried onions, raisins, etc.) Then, sprinkle the dough with the remainder of the flour and cover the bowl with a kitchen towel. Allow dough to rise for about half an hour. Turn on your oven to 200 °C (I turned on the air circulation mode and also placed a small bowl with water into the oven). Line two baking tins with baking parchment. 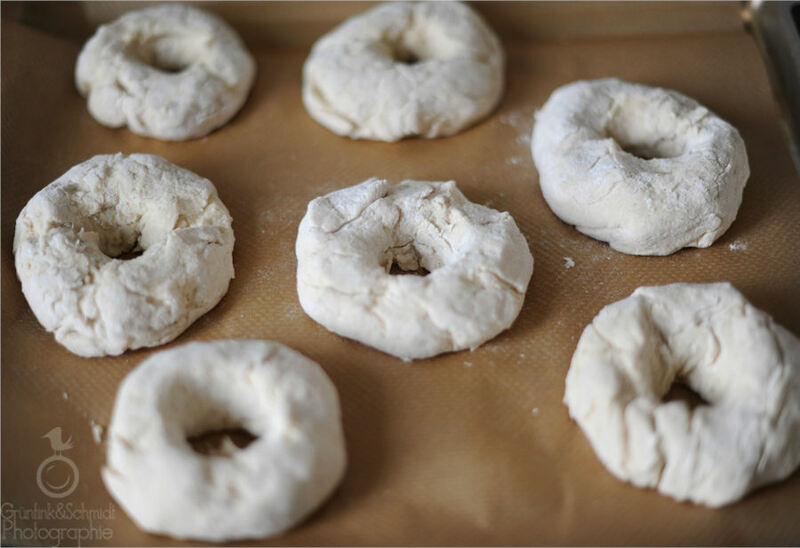 Then, split the dough into ten pieces and form bagels. I did this by forming a bun, then poking a hole into the middle of the bun with my finger, which I then extended a bit from within. 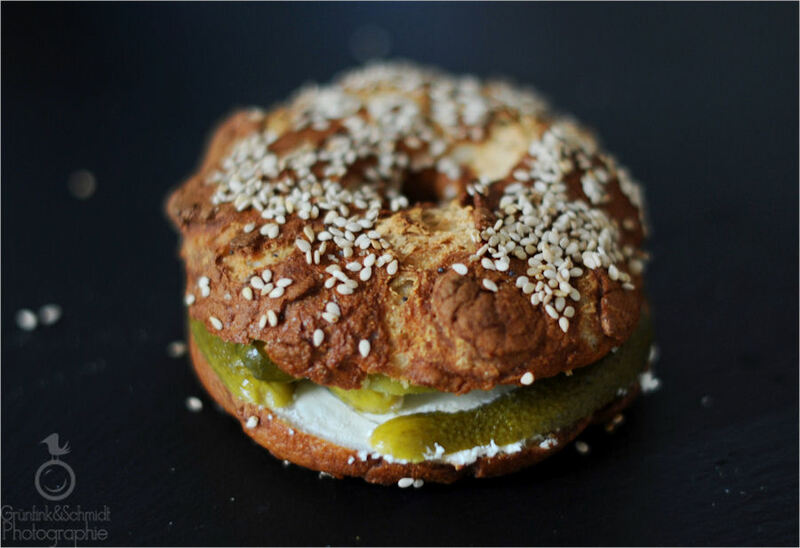 Place bagel on baking parchment. Repeat with the remainder of the dough. Allow bagels rest for about twenty minutes. 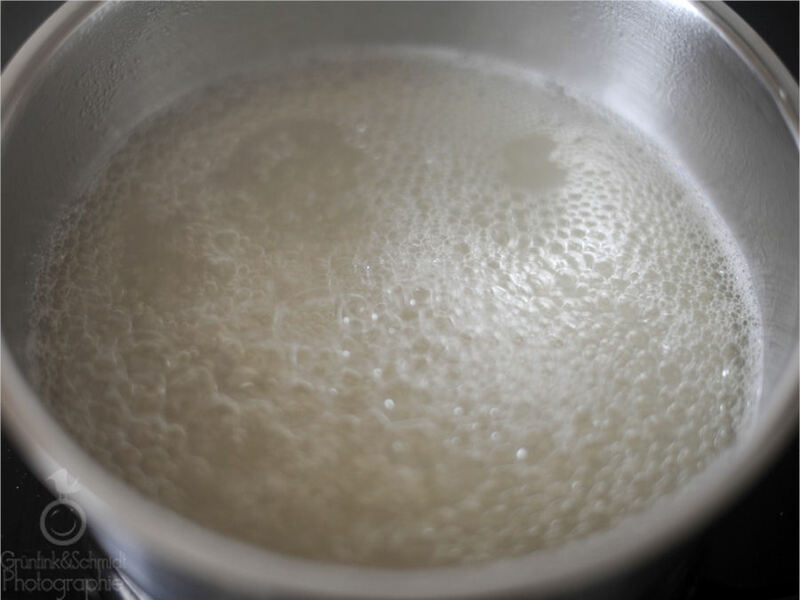 Then, heat the litre of water in a pot, and add the baking soda and sugar once it has come to a boil. Place the bagels in the boiling water using a wide spatula. 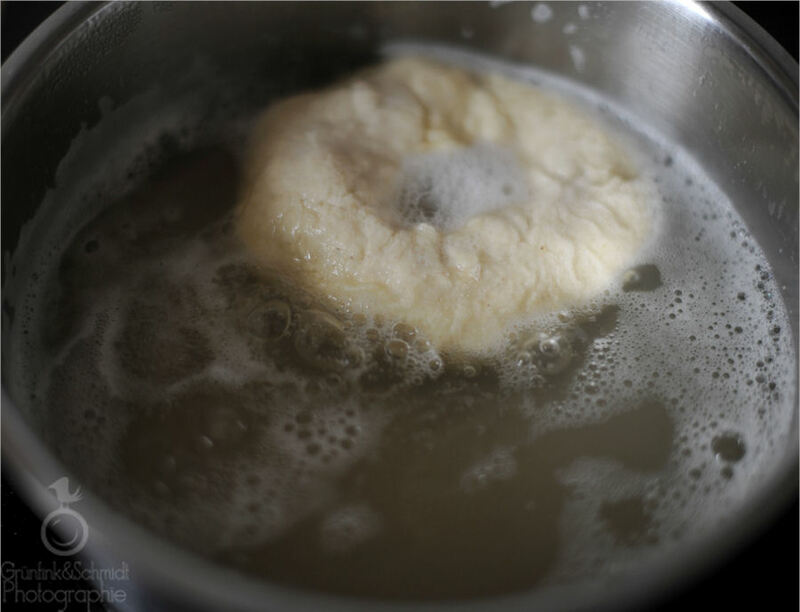 Turn after about twenty seconds and boil the bagel for another twenty seconds. Place bagel back on baking parchment. Sprinkle with whatever topping you choose (I had sesame, plain and poppyseed as well as an assortment of all seeds available in my cupboard). Repeat the boiling with the remaining bagles. 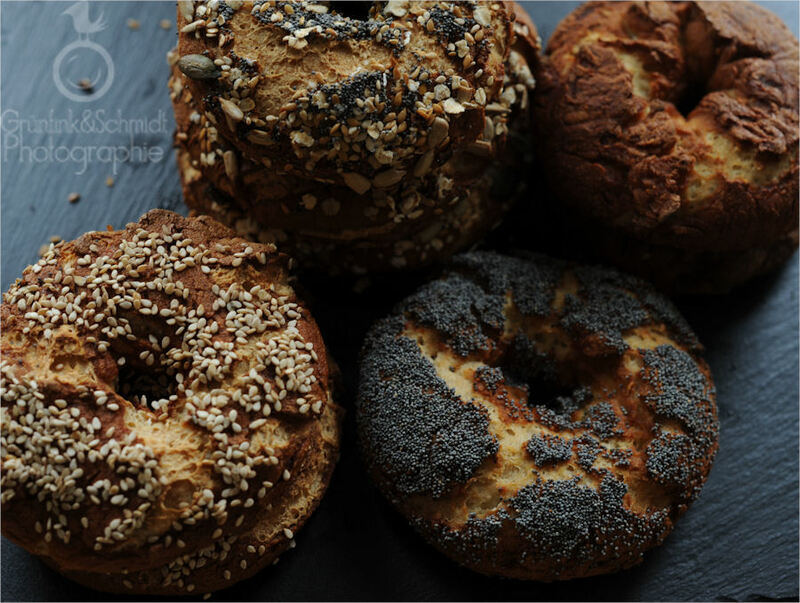 Place the bagels into the oven and bake for about twenty minutes or until they are golden brown and done inside (stick a fork into one of them and see if it comes back dry, then you can remove them from the oven). 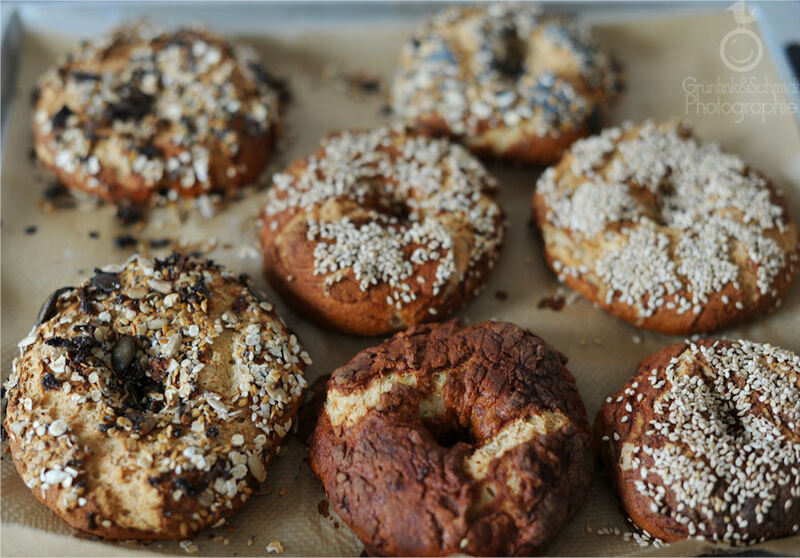 Allow bagels to cool and indulge! These babies are also amazing when they are toasted, but since I lack a toaster and was incredibly hungry, I just ate it right up. Yum! I had mine the way I learnt how to eat them in college: with cream cheese and pickles! (Yeah, people used to come up and ask me if I was pregant, but it’s a really good combination, I swear!) Sadly, I forgot to buy sprouts and avocado at the supermarket earlier today. Ohmygod Marion, I’m so sorry – I JUST fully read this! Thank you so much for posting!! And those bagels look DELICIOUS!! What kind of camera do you use do photograph your food? It looks like it’s good quality! Pingback: Gluten-free Doughnuts and Doughnut-Holes | Vegetarian - and gluten-free!